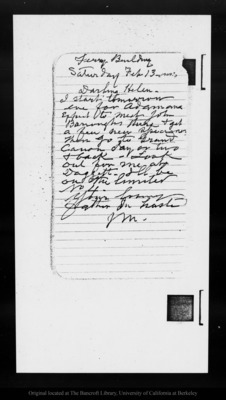 Letter from John Muir to Helen [Muir],  Feb 13. Ferry BuildingSaturday Feb 13-[1909? ]Darling Helen-I start tomorrow eve for Adamana expect to meet John Barroughs there & get a few new specimens Then go to Grand Canon day or two & back - Look out for me at Daggett. Ill be on the limited No 4.Your lovingfather In hasteJ M.
National Archives. Please contact this institution directly to obtain copies of the images or permission to publish or use them beyond educational purposes.